Priority habitats are present across the entire Taw Valley FF area and therefore integrated and whole farm working will be encouraged. From our research and modelling we know that increased woodland planting and culm grassland restoration will improve water quality and reduce flooding. Local research results show that the culm can store up to 4 times as much water as improved grassland. Woodland management will be supported by providing collective markets for the produce and training in how to value a woodland so that it becomes a better business proposition to manage. 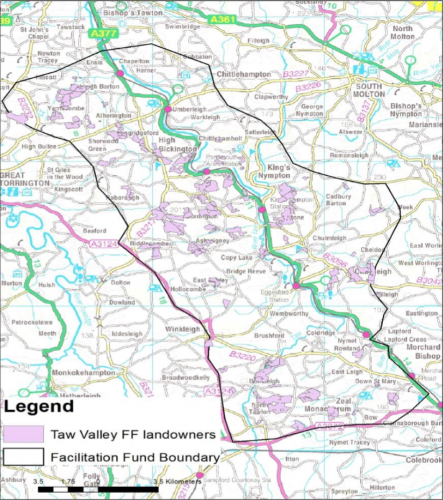 Flood plain grazing marsh, riparian habitats and other measures in the rivers (removal of barriers, buffer strips, shading and bank management) will be looked at in connection with the land fronting and draining into the rivers. Through the fund we will provide the workshops, events and training to achieve better water quality and flood resilience through soil and land management. This will also support the phosphate and nitrogen reduction actions required in the area. The workshops will look at yard infrastructure to improve water management practices and support applications to CS.